Find the T Drive and double-click. Then create a folder with your Username if one does not exist. Put the files that will be stored on the T Drive into this folder. Remember only put files in this folder if there is more then 1 GB to store. If less then 1 GB go here for a guide on creating a desktop folder. 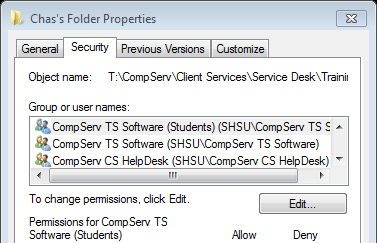 After the files have been moved right-click on the folder and choose Properties. There will be a box that has groups of users that can either be allowed or denied access to the folder. Choose which users will be denied access and click "Edit". Drop down to the box below the user list and click the Deny box on the Full Control line to completely deny access to that group of users. Click Apply after altering the permissions and voila the folder is now secure.